Destination: Hanoi - Ba Be lake - Bao Lac - Meo Vac - Dong Van - Ha Giang - Vu Linh - Hanoi. This 6 Day Motorbike Tour to Ha Giang and Northeast is one of our most favorite Vietnam motorcycle tours. It does not only offer the amazing view of Global Rock Plateau in Dong Van, Ha Giang, beautiful natural lake of Ba Be but also gives plenty of chances to visit and discover the colorful culture of the local hill tribes who have the hard life but always are happy and proud of their culture and homeland. Please click here to view the route! Day 1: Vietnam motorbike tour to Ba Be Lake From Hanoi. – 240 Km. This great motorcycle tour to Ba Be Lake – northeast of Vietnam starts at around 8 AM. We try the best to avoid busy city road in the morning until Cho Chu town( in Thai Nguyen province) where we have luch. After lunch, we surely have enjoyable motorcycle ride to Ba Be because the roads have less traffic and offers you a lot of grand mountain view. At about 4 PM, We arrive Pac Ngoi – a beautiful village of Tay people which located peacefully at Ba Be lake’s side. Diner and stay with the Tay’s family. Ba Bể Lake (Vietnamese: Hồ Ba Bể; Ba means Three, Bể is from the Tay language word pé, meaning “lake”) is the largest natural lake in Vietnam. It is located in Nam Mẫu commune, Bắc Kạn district, Bắc Kạn Province in the northeastern region of the country. Having been formed approximately 200 million years ago, the lake is surrounded by limestone cliffs, which in turn are covered by primary forests. The lake comprises three zones named Pé Lầm, Pé Lù, and Pé Lèng. Three rivers, named Năng, Tả Han, and Nam Cường, are the main inflows of the lake. The Năng river enters the lake through a large waterfall called Đầu Đẳng. In the lake there are also three islands, named Án Mã, Khẩu Cúm, and Po Gia Mải (literally “Widow’s Island”). Ba Bể Lake is a featured geographical science and is a biodiversity reservoir. It is a part of the Ba Be National Park. Day 2: North Vietnam Motorbike Tour to Bao Lac – 120 km. After the simple local breakfast with the family, Take a short walk about 1km to the pier and then enjoy one and a half hour boat cruise around the largest natural lake in Vietnam – Ba Be. Lunch with the Tay family, In the after noon we will have short but best off-road motorbike tour in Vietnam. The ride is through small part of Ba Be National Park, many beautiful villages and some streams, the tour will give you a lot of challenge and amazing beauty of the northern mountain area. Arrive Bao Lac at 5 PM. Stay in town – Hotel. Day 3: Amazing Motorbike tour to Dong Van. – 120 km. After 2 first difficult days of long and off-road motorbike riding, today we will have relaxing and easy day. Start the day at about 9 Am, ride slowly along the Gam river to enjoy the green mountains and mountains. We will be in Meo Vac for lunch. After lunch, it could be the best motorbike tour in Vietnam to ride cross Ma-Pi-Leng pass ( It’s one of the longest and most beautiful passes in North Vietnam. We can have hundreds of stops for picture of The Dong Van Rock Plateau Global Geo-park, and the local ethnic minorities. Stay overnight in Dong Van town – Hotel. Day 4: Enjoyable motorbike ride through the rock plateau to Ha Giang – 140 km. Today’s ride must be another highlight of the trip as we will visit one of the most remote land in Vietnam where are special with many ethnic groups with their unique cultures and imposing mountain view of the Rock Plateau, the Vuong palace in Dong Van, The “Heaven Gate” in Quan Ba. 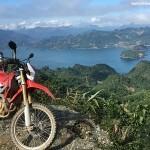 This is surely the best motorbike tour in northern Vietnam with many interesting and amazing things in every meter of the road. Arrive Ha Giang in the late afternoon. Dinner and stay with the other Tay’s family . Day 5: Ha Giang Motorbike tour to Thac Ba lake – Vu Linh – 160 km. Thac Ba Lake is one of the largest and most beautiful artificial lakes of Vietnam. The lake was created as part of the hydroelectric plant project in Yen Bai in the 1960s. It boasts clear water surrounded by mountains and tropical forests. There are 30 different ethnic groups living in surrounding regions of Thac Ba Lake. Among them, Tay, Nung, Thai, Muong, Dzao and Kho Mu ethnic people still proudly keep their primitive traditions and customs. Vu Linh is one of the Dzao’s beautiful villages which is chosen by Vietnam motorbike tour expert to stay. The village is located close to the Thac Ba lake so we can have great chance to discover the beauty of the lake at any time. The motorbike tour to Vu Linh from Ha Giang is a light adventure. For the first half, we will motorcycle on the wide and smooth high way No 2. for the second half, we will have a good discovery of Vietnam countryside by motorbike. The ride after lunch is mostly through the rice paddies and small villages. We will be in Vu Linh at about 3 PM. Spend the rest time of the day to discover Thac Ba lake by a small local fishing boat. Overnight in Vu Linh – Home stay. Day 6: Finishing the great North Vietnam motorbike tour back to Hanoi. – 180 km. 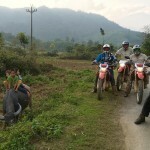 Motorbike Tour Expert will do the best to avoid the main busy road for as long as possible . we will ride longer to get to road No2B in which there is less traffics on. Then hit the road down to Red River Delta. The roads are the mixture of both challenging track and different interest all the way back to Hanoi. Be at Hanoi before rush hours and ends the enjoyable Northeast Vietnam motorbike tour safely!